With Christmas just days away, many of us have been busy shopping for gifts. 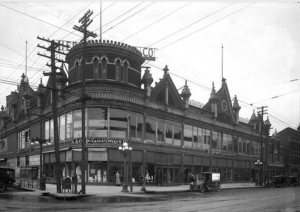 In the early days of Lincoln, residents had the choice of two department stores, Miller & Paine and Herpolsheimer’s. While Miller & Paine may be a name Nebraskan’s recognize I’m guessing most people don’t recognize the Herpolsheimer Company. 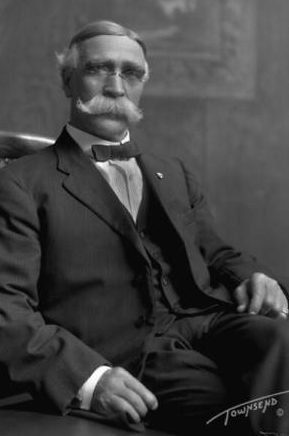 Henry Herpolsheimer first opened a dry goods store with Otto Mohrenstecher on O Street in downtown Lincoln. According to Lincoln historian Jim McKee, Henry built a new, 73,000-square-foot store at the corner of 12th and N Street in 1880. As you can see in the pictures of the building, there were large windows on the north side of the building. The store earned the nickname “The Daylight Store” because of the large windows and electric lights. A window display of corsets was featured in the 1908 Dry Goods Reporter, Volume 38. According to the caption, the window was decorated by A. G. Sten. As a side note, if you are interested in photography note the article above the photo. It describes the steps you should take to get good photographs of display windows both during the day and at night. The night exposures could take up to thirty minutes. 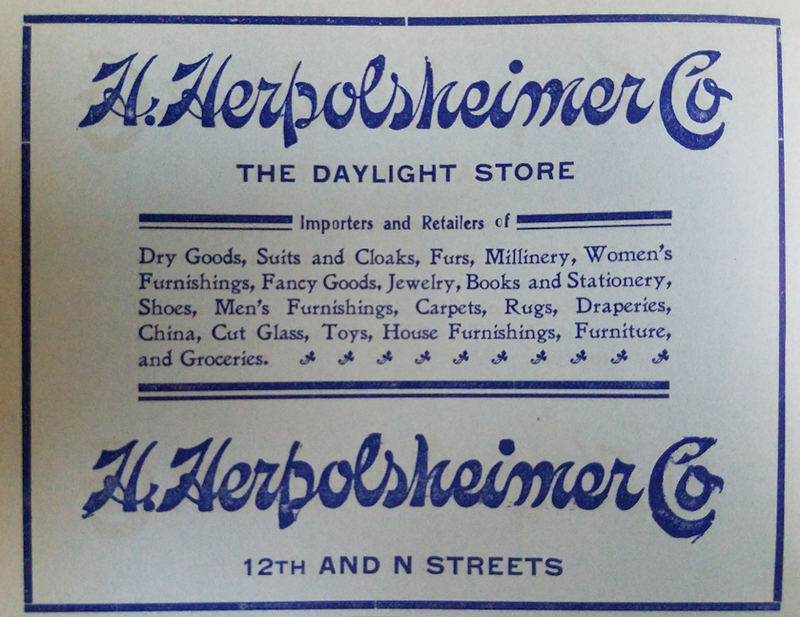 Herpolsheimer’s sold a wide variety of goods. 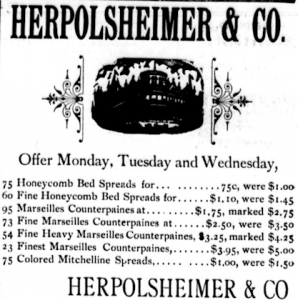 An ad in the January 28, 1893 issue of the Capital City Courier listed bedspreads, spreads and counterpaines for sale. The prices ranged from seventy-five cents up to $5.00. 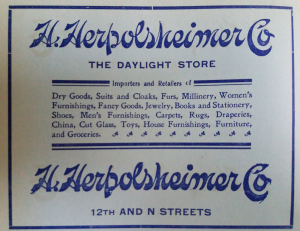 The ad for the H. Herpolsheimer Co. in the 1908 Lincoln Nebraska Directory (Jacob North & Company), lists many items for sale including dry goods, men’s and women’s furnishings, fancy goods, furs, toys and groceries. 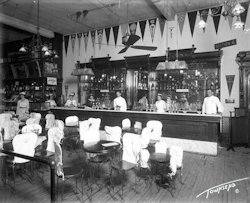 While I couldn’t find any information or advertisements for the soda fountain in the store, these 1914 photos show that they had one at that time. The signs on wall advertise items such as Dickinson’s Maple Mousse, a Mallow bitter sundae, Coca-Cola, and Vassar chocolates. The Herpolsheimer Co. closed in 1931. I don’t know exactly when the building was torn down but by early 1939, a Firestone service station stood in its place at the corner of 12th and N. While there is still a Firestone station on that corner today, the original building was torn down and replaced in 1998. This entry was posted in General, Information Resources, Nebraska Memories, Technology. Bookmark the permalink. ← Free Video–Nebraska Mental Health: Who’s Responding? My great-grandmother was Kathryn Herpolscheimer Schmidt (Smith), of Lincoln, Nebraska. I wondered if this was her father, uncle, brother. My paternal grandmother was married to a son of Henry Herpolsheimer, Erwin (although the Omaha paper says it was Irving – maybe a misspelling.). Her maiden name was Bertha G. True, she was a musician from Omaha. They had one son, Henry, my fathers half-brother. At some point they divorced and she married my grandfather, Ernest Nieschmidt. I’m sure it was quite scandalous for the times! I would love to hear from you if you learn more about Kathryn! I’m just beginning my foray into my family genealogy. Lynne, my research focused on the business not the family. I don’t know anything about Mr. Herpolsheimer’s family. If you are interested in genealogy, you could have a lot of fun researching the Herpolsheimer family to see if you are a relative.